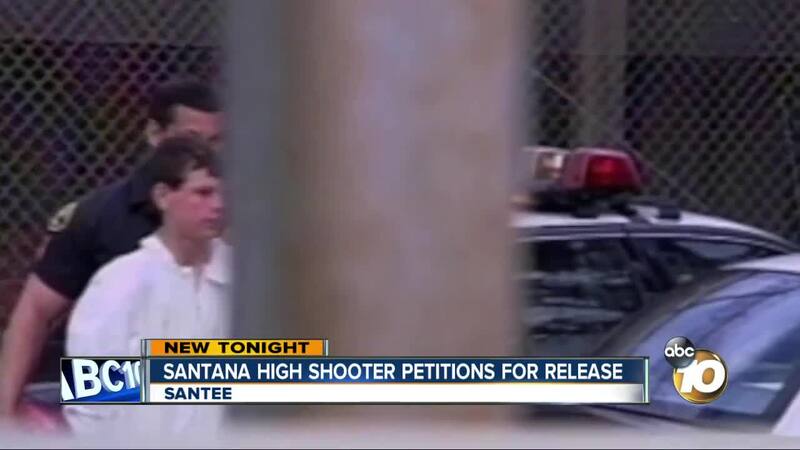 SANTEE, Calif. (KGTV) - The convicted gunman in the 2001 mass shooting at Santana High School in Santee is petitioning the governor to be released. Charles Andrew Williams, who goes by Andy, is incarcerated at Valley State Prison in Central California for killing two classmates and injuring 13 others. According to the San Diego County District Attorney’s Office, Williams has petitioned the governor for a sentence commutation. He is currently serving 25 years and is eligible for his initial parole hearing 2025. The petition comes after Gov. Jerry Brown signed a bill earlier this year that prohibits prosecutors from trying defendants under 16 years old as adults. The bill will take effect in 2019; Williams was 15 years old when he went on a shooting spree. Barry Gibson, who was shot in the leg, said he was notified by the district attorney and was mortified. “It has come to my attention that clemency is being considered for Andy Williams, the one who murdered my son. I don't feel that clemency should be granted to Andy Williams because he's a murderer. He took that weapon to school that one morning March 5, 2001. Shot 30 rounds at random students and teachers. So many feared for their lives that day. Two students killed and13 injured. Paul Pfingst, who was the county district attorney at the time of the shooting, said Williams’ sentence was already reduced from 50 years to 25 years. He thinks there is a slim chance the governor will grant Williams’ request. “The only possible reason to commute a once 50-to-life sentence to something less than 25 years is consideration of the fact that the killer was 15 years old, and I don't think that’s enough, and I don't think any governor is going to think that's enough,” Pfingst said. The DA’s office said they adamantly oppose the petition for release. The governor’s office said they do not comment on individual cases.